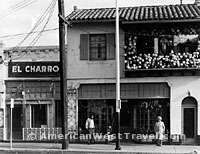 Established in 1922, the historic El Charro Cafe is the nation's oldest Mexican restaurant in continuous operation by the same family. It also enjoys the distinction of being a woman owned and run business since the beginning. The current owner - and head chef - Carlotta Dunn Flores (photo, right) is a grand niece of the original owner. The restaurant was located for decades on Broadway in old downtown Tucson. Today it is in five more modern locations throughout the city, continuing to serve Sonoran-Mexican food in the "Old Tucson" style. It is satisfying to report that this restaurant continues to offer outstanding food, great ambience, and beautiful artwork accumulated over the years. 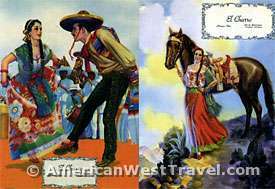 In October 2008, Gourmet Magazine named El Charro one of "21 legendary restaurants you must visit." We recently visited one of El Charro's newest locations on Oracle Road in Oro Valley, just north of the Tucson city limits. The location in a new building in a huge shopping center does not detract at all from the experience. The restaurant was crowded on this Sunday night, and there was a modest wait. So we headed to the bar. It quickly became apparent that we had the best seats in the house at the bar. The bar itself featured a wide counter and soft high-back chairs. The huge picture windows behind the bar were filled with a spectacular view of the Santa Catalina Mountains. 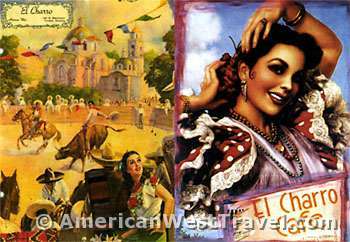 Above the picture windows was a huge row of posters featuring the many menu covers used during El Charro's lifetime. As large posters, they are beautiful and mesmerizing artwork. The back wall was also covered with murals and photos from the old days. Both ends of the bar also featured large-screen HDTV's with the obligatory ball game. The sound was off so they did not detract from the experience. In fact, live Mexican music filtered in from elsewhere in the restaurant, which was quite pleasant. The amiable bartender invited us to enjoy dinner with her at the bar. We readily accepted, pointing out that these were obviously the best seats in the restaurant, and she readily agreed with that. We had previously eaten at a different El Charro location, and knew exactly what we wanted to eat, in fact had looked forward to it for a long time - about three years. Pozole is a traditional pre-Columbian Mexican soup or stew. It is rather elaborate dish not served by all Mexican restaurants. El Charro prepares it on weekends only. A good bowl of Pozole tells you something about a Mexican restaurant, as a top-notch bowl of Hot-and-Sour soup tells you about a Chinese restaurant. Pozole consists of hominy, hunks of pork, and chili pepper in a rich seasoned broth. It is traditionally served with numerous garnishes such as oregano, lime, cabbage, avocado, radishes, cheese, and tortillas. It could be a meal in itself. El Charro's large Pozole ($7.25) came in a bowl about ten inches wide and four inches deep. It could easily have fed four people with a hugely generous portion of pork. It featured a beautiful broth, ideally seasoned, not overly spicy. The pork pieces told their own story: not a scrap of fat anywhere and tender enough to break apart with a spoon. Score an A+ for the Pozole. Our second and final dish was El Charro's legendary house specialty, "The Famous Carne Seca Plate" ($16.95). Gourmet Magazine described it as "a taste explosion." They got that right. The dish is essentially shredded beef grilled with green chilis, tomatoes, and onions. However the preparation of the meat is quite special. The beef is marinated in garlic, lime juice, and secret seasonings. It is then sun-dried in wire cages. The result is quite amazing. The shredded beef is satisfyingly chewy and meaty yet at the same time perfectly tender. It is thoroughly and utterly imbued with the aroma of the grill. The beef is accompanied by pinto beans, rice, salsa, guacamole, and tortillas. This platter by itself would be a sufficient meal for two people. Score an A+ for the Carne Seca. Between the excellent food and the outstanding ambience, this was easily my best restaurant experience in quite some time. Score five stars (*****) for El Charro Cafe in Oro Valley. For more information, including locations, visit the El Charro Cafe online.